Keep your environment infection free with daily monitoring of the weather indicators that create conditions that are most conducive to infection spread. The moisture present indoors, or indoor weather, is the leading indicator of increased susceptibility to infection spread. 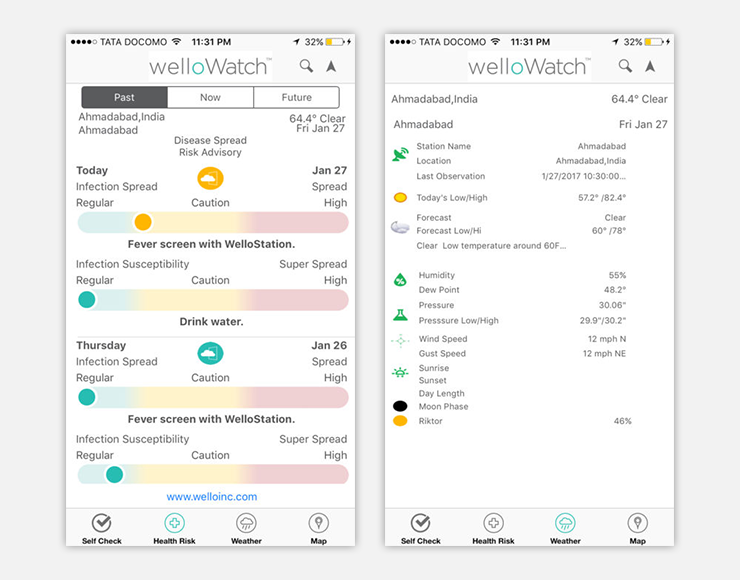 Features: WelloWatch predicts the indoor moisture levels based on the current and forecast outside temperature. WelloWatch provides alerts and powers indoor digital signage to alert all employees, visitors, patients and others to accurately pin-point infection risk transmission and susceptibility. WelloWatch promotes a healthy indoor environment by providing advanced notice to prevent disease spread at your company, public building, hospital facility, and educational institution. Be alerted to super-spread conditions when infection risk is the highest Access real-time infection data globally Customize user alerts Stay up to date with local and world-wide weather conditions. Kalp corporate is an innovative technology and business driven professional services firm. Our talented, dynamic and young professionals are skillful in PHP, Android and iOS Development, The entire team serves with diligence to deliver cost effective and interactive Design & Development solutions without compromising on quality and definitely upholding client deadlines. Our range of services include:- PHP, Mobile Application Development, Web Designing & Development, Open Source Development and e-Commerce Development. We help to groom your business according to your needs and requirements, and client satisfaction is our motto. Let's our work speak about us.